I am delighted that I will be one of the artists involved in “Draw In” organized by my friend Julie Douglas which takes place in my home town of Belfast from 25th August to 5th September 2014. I will be taking part in a panel event and giving a portrait painting demo. I will also be teaching portrait drawing in charcoal. The event takes place in the Art College in Belfast which is exciting for me as I haven’t been back there for many years. Julie has gathered together a great line up of artists and I am very much looking forward to meeting them all. I am particularly keen to hear all about the atelier movement in the USA from Colleen Barry and Matt Weigle. 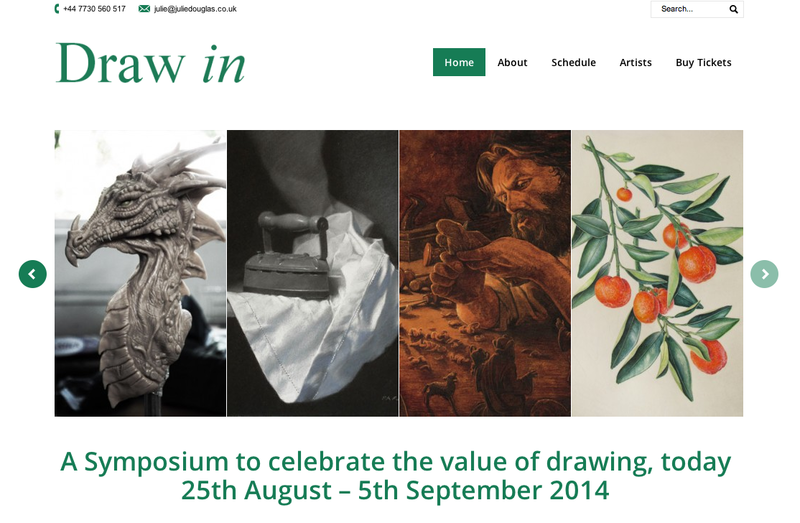 “A drawing event, consisting of a weekend Symposium and two 5 day workshops, bringing together world class artists and creative professionals to put the spotlight on good observational drawing skills. They will share how they do it, and through demonstrations, discussions and workshops, they will teach you how to do it too. The aim is to celebrate excellence in drawing. You will view some amazing drawings, paintings, sketch books and work in progress by the invited artists and learn how to improve your own skills in a friendly, inclusive environment. Drawing is relevant and contemporary, even in this world of technology. Drawing is a powerful tool towards personal well being, far beyond the delicious act of mark-making itself.